This article is about the Soviet/Russian reusable space programme. For the orbiter launched in 1988 see Buran (spacecraft). For other uses, see Buran (disambiguation). The Buran programme (Russian: Бура́н, IPA: [bʊˈran], "Snowstorm" or "Blizzard"), also known as the "VKK Space Orbiter programme" ("VKK" is for Russian: Воздушно Космический Корабль, "Air Space Ship"), was a Soviet and later Russian reusable spacecraft project that began in 1974 at the Central Aerohydrodynamic Institute in Moscow and was formally suspended in 1993. In addition to being the designation for the whole Soviet/Russian reusable spacecraft project, Buran was also the name given to Orbiter K1, which completed one unmanned spaceflight in 1988 and was the only Soviet reusable spacecraft to be launched into space. The Buran-class orbiters used the expendable Energia rocket as a launch vehicle. They are generally treated as a Soviet equivalent of the United States' Space Shuttle, but in the Buran project, only the airplane-shaped orbiter itself was theoretically reusable. While Orbiter K1 was recovered successfully after its first orbital flight in 1988, it was never reused. The Buran programme was started by the Soviet Union as a response to the United States Space Shuttle program. The project was the largest and the most expensive in the history of Soviet space exploration. Development work included sending BOR-5 test vehicles on multiple sub-orbital test flights, and atmospheric flights of the OK-GLI aerodynamic prototype. Buran completed one unmanned orbital spaceflight in 1988 before its cancellation in 1993. 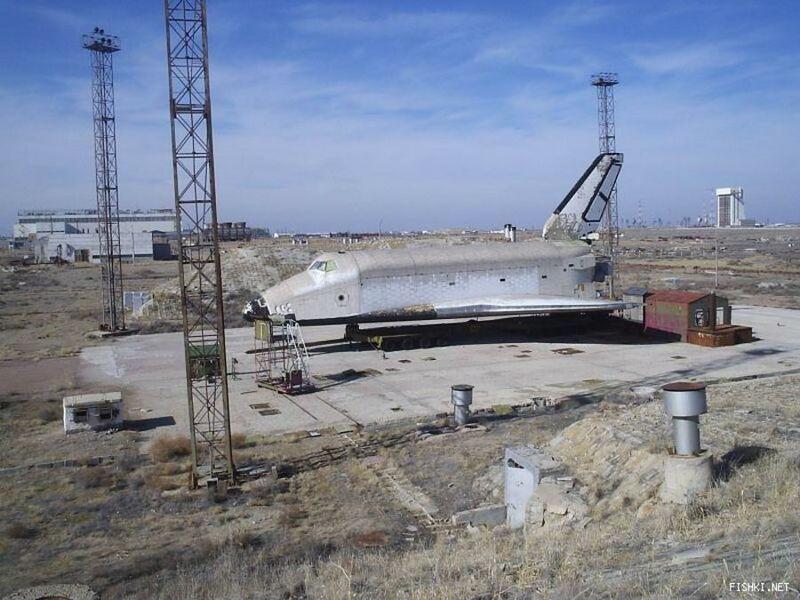 Orbiter K1, which flew the test flight in 1988 was crushed in a hangar collapse on 12 May 2002 in Kazakhstan. The OK-GLI resides in Technikmuseum Speyer. Although the Buran class was similar in appearance to NASA's Space Shuttle orbiter, and could similarly operate as a re-entry spaceplane, its internal and functional design was distinct. For example, the main engines during launch were on the Energia rocket and were not taken into orbit by the spacecraft. Smaller rocket engines on the craft's body provided propulsion in orbit and de-orbital burns. The Buran orbital vehicle programme was developed in response to the U.S. Space Shuttle programme, which in the 1980s raised considerable concerns among the Soviet military and especially Defense Minister Dmitry Ustinov. An authoritative chronicler of the Soviet and later Russian space programmes, the academic Boris Chertok, recounts how the programme came into being. [full citation needed] According to Chertok, after the U.S. developed its Space Shuttle programme, the Soviet military became suspicious that it could be used for military purposes, due to its enormous payload, several times that of previous U.S. launch vehicles. The Soviet government asked the TsNIIMash (ЦНИИМАШ, Central Institute of Machine-building, a major player in defense analysis) for an expert opinion. Institute director, Yuri Mozzhorin, recalls that for a long time the institute could not envisage a civilian payload large enough to require a vehicle of that capacity. Like its American counterpart, the Buran orbital vehicle, when in transit from its landing sites back to the launch complex, was transported on the back of a large jet aeroplane — the Antonov An-225 Mriya transport aircraft, which was designed in part for this task and remains the largest aircraft in the world to fly multiple times. [full citation needed] Before the Mriya was ready (after the Buran had flown), the Myasishchev VM-T Atlant, a variant on the Soviet Myasishchev M-4 Molot (Hammer) bomber (NATO code: Bison), fulfilled the same role. The Soviet reusable space-craft programme has its roots in the very beginning of the space age, the late 1950s. The idea of Soviet reusable space flight is very old, though it was neither continuous, nor consistently organized. 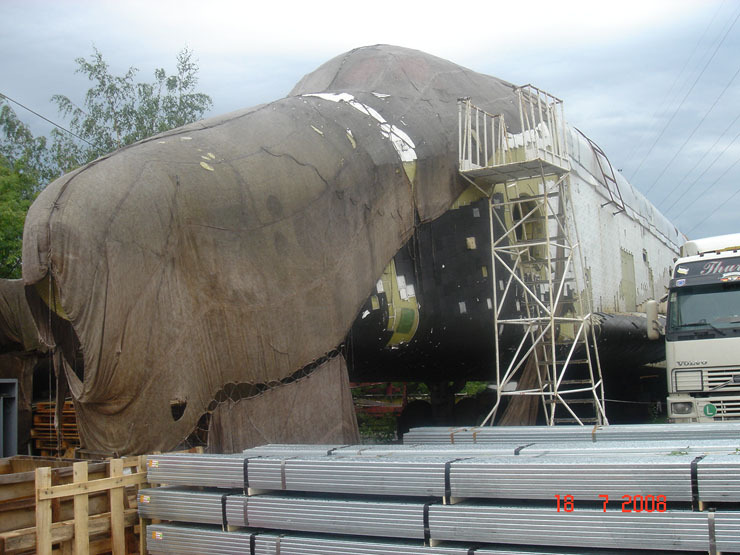 Before Buran, no project of the programme reached production. The idea saw its first iteration in the Burya high-altitude jet aircraft, which reached the prototype stage. Several test flights are known, before it was cancelled by order of the Central Committee. The Burya had the goal of delivering a nuclear payload, presumably to the United States, and then returning to base. The cancellation was based on a final decision to develop ICBMs. The next iteration of the idea was Zvezda from the early 1960s, which also reached a prototype stage. Decades later, another project with the same name was used as a service module for the International Space Station. After Zvezda, there was a hiatus in reusable projects until Buran. The development of the Buran began in the early 1970s as a response to the U.S. Space Shuttle program. Soviet officials were concerned about a perceived military threat posed by the U.S. Space Shuttle. In their opinion, the Shuttle's 30-ton payload-to-orbit capacity and, more significantly, its 15-ton payload return capacity, were a clear indication that one of its main objectives would be to place massive experimental laser weapons into orbit that could destroy enemy missiles from a distance of several thousands of kilometers. Their reasoning was that such weapons could only be effectively tested in actual space conditions and that to cut their development time and save costs it would be necessary to regularly bring them back to Earth for modifications and fine-tuning. Soviet officials were also concerned that the U.S. Space Shuttle could make a sudden dive into the atmosphere to drop bombs on Moscow. Soviet engineers were initially reluctant to design a spacecraft that looked superficially identical to the Shuttle, but subsequent wind tunnel testing showed that NASA's design was already ideal. Even though the Molniya Scientific Production Association proposed its Spiral programme design (halted 13 years earlier), it was rejected as being altogether dissimilar from the American shuttle design. While NPO Molniya conducted development under the lead of Gleb Lozino-Lozinskiy, the Soviet Union's Military-Industrial Commission, or VPK, was tasked with collecting all data it could on the U.S. Space Shuttle. Under the auspices of the KGB, the VPK was able to amass documentation on the American shuttle's airframe designs, design analysis software, materials, flight computer systems and propulsion systems. The KGB targeted many university research project documents and databases, including Caltech, MIT, Princeton, Stanford and others. The thoroughness of the acquisition of data was made much easier as the U.S. shuttle development was unclassified. The construction of the shuttles began in 1980, and by 1984 the first full-scale Buran was rolled out. The first suborbital test flight of a scale-model (BOR-5) took place as early as July 1983. As the project progressed, five additional scale-model flights were performed. A test vehicle was constructed with four jet engines mounted at the rear; this vehicle is usually referred to as OK-GLI, or as the "Buran aerodynamic analogue". The jets were used to take off from a normal landing strip, and once it reached a designated point, the engines were cut and OK-GLI glided back to land. This provided invaluable information about the handling characteristics of the Buran design, and significantly differed from the carrier plane/air drop method used by the United States and the Enterprise test craft. Twenty-four test flights of OK-GLI were performed by the Gromov Flight Research Institute test pilots and researchers after which the shuttle was "worn out". The developers considered using a couple of Mil Mi-26 helicopters to "bundle" lift the Buran, but test flights with a mock-up showed how risky and impractical that was. The VM-T ferried components and the Antonov An-225 Mriya (the heaviest airplane ever) was designed and used to ferry the shuttle. The flight and ground-testing software also required research. In 1983 the Buran developers estimated that the software development would require several thousand programmers if done with their existing methodology (in assembly language), and they appealed to Keldysh Institute of Applied Mathematics for assistance. It was decided to develop a new high-level "problem-oriented" programming language. Researchers at Keldysh developed two languages: PROL2 (used for real-time programming of onboard systems) and DIPOL (used for the ground-based test systems), as well as the development and debugging environment SAPO PROLOGUE. There was also an operating system known as Prolog Manager. Work on these languages continued beyond the end of the Buran project, with PROL2 being extended into SIPROL, and eventually all three languages developed into DRAKON which is still in use in the Russian space industry. A declassified May 1990 CIA report citing open-source intelligence material states that the software for the Buran spacecraft was written in "the French-developed programming language known as Prolog", possibly due to confusion with the name PROLOGUE. Until the end of the Soviet Union in 1991, seven cosmonauts were allocated to the Buran programme and trained on the OK-GLI ("Buran aerodynamic analogue") test vehicle. All had experience as test pilots. They were: Ivan Ivanovich Bachurin, Alexei Sergeyevich Borodai, Anatoli Semyonovich Levchenko, Aleksandr Vladimirovich Shchukin, Rimantas Antanas Stankevičius, Igor Petrovich Volk and Viktor Vasiliyevich Zabolotsky. A rule, set in place for cosmonauts because of the failed Soyuz 25 of 1977, insisted that all Soviet space missions contain at least one crew member who has been to space before. In 1982, it was decided that all Buran commanders and their back-ups would occupy the third seat on a Soyuz mission, prior to their Buran spaceflight. Several people had been selected to potentially be in the first Buran crew. By 1985, it was decided that at least one of the two crew members would be a test pilot trained at the Gromov Flight Research Institute (known as "LII"), and potential crew lists were drawn up. Only two potential Buran crew members reached space: Igor Volk, who flew in Soyuz T-12 to the space station Salyut 7, and Anatoli Levchenko who visited Mir, launching with Soyuz TM-4 and landing with Soyuz TM-3. Both of these spaceflights lasted about a week. Levchenko died of a brain tumour the year after his orbital flight, Bachurin left the cosmonaut corps because of medical reasons, Shchukin was assigned to the back-up crew of Soyuz TM-4 and later died in a plane crash, Stankevičius was also killed in a plane crash, while Borodai and Zabolotsky remained unassigned to a Soyuz flight until the Buran programme ended. Igor Volk was planned to be the commander of the first manned Buran flight. There were two purposes of the Soyuz T-12 mission, one of which was to give Volk spaceflight experience. The other purpose, seen as the more important factor, was to beat the United States and have the first spacewalk by a woman. At the time of the Soyuz T-12 mission the Buran programme was still a state secret. The appearance of Volk as a crew member caused some, including the British Interplanetary Society magazine Spaceflight, to ask why a test pilot was occupying a Soyuz seat usually reserved for researchers or foreign cosmonauts. Anatoli Levchenko was planned to be the back-up commander of the first manned Buran flight, and in March 1987 he began extensive training for his Soyuz spaceflight. In December 1987, he occupied the third seat aboard Soyuz TM-4 to Mir, and returned to Earth about a week later on Soyuz TM-3. His mission is sometimes called Mir LII-1, after the Gromov Flight Research Institute shorthand. When Levchenko died the following year, it left the back-up crew of the first Buran mission again without spaceflight experience. A Soyuz spaceflight for another potential back-up commander was sought by the Gromov Flight Research Institute, but never occurred. Site 110 — Used for the launch of the Buran-class orbiters. Like the assembly and processing hall at Site 112, the launch complex was originally constructed for the Soviet lunar landing programme and later converted for the Energia-Buran programme. Site 112 — Used for orbiter maintenance and to mate the orbiters to their Energia launchers (thus fulfilling a role similar to the VAB at KSC). The main hangar at the site, called MIK RN or MIK 112, was originally built for the assembly of the N1 moon rocket. 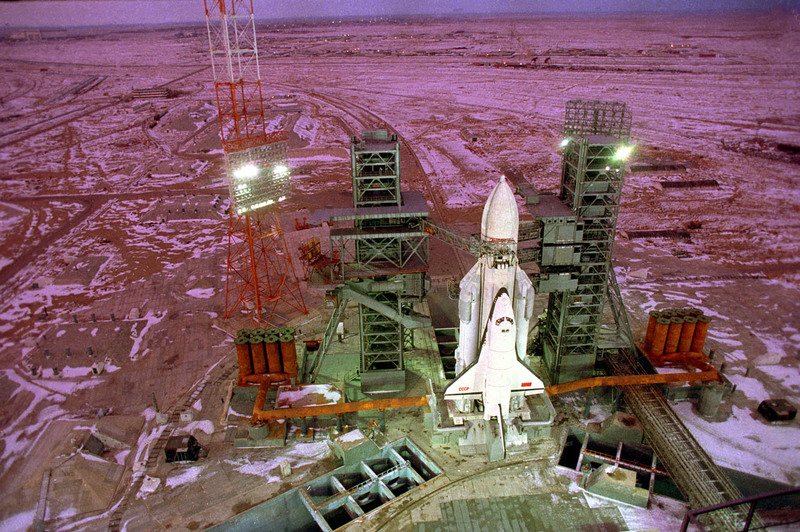 After cancellation of the N-1 programme in 1974, the facilities at Site 112 were converted for the Energia-Buran programme. It was here that Orbiter K1 was stored after the end of the Buran programme and was destroyed when the hangar roof collapsed in 2002. Site 251 — Used as Buran orbiter landing facility, also known as Yubileyniy Airfield (and fulfilling a role similar to the SLF at KSC). It features one runway, called 06/24, which is 4,500 metres (4,900 yd) long and 84 metres (92 yd) wide, paved with "Grade 600" high quality reinforced concrete. At the edge of the runway was a special mating-demating device, designed to lift an orbiter off its Antonov An-225 Mriya carrier aircraft and load it on a transporter, which would carry the orbiter to the processing building at Site 254. A purpose-built orbiter landing control facility, housed in a large multi-storey office building, was located near the runway. Yubileyniy Airfield was also used to receive heavy transport planes carrying elements of the Energia-Buran system. After the end of the Buran programme, Site 251 was abandoned but later reopened as a commercial cargo airport. Besides serving Baikonur, Kazakh authorities also use it for passenger and charter flights from Russia. Site 254 — Built to service the Buran-class orbiters between flights (thus fulfilling a role similar to the OPF at KSC). Constructed in the 1980s as a special four-bay building, it also featured a large processing area flanked by several floors of test rooms. After cancellation of the Buran programme it was adapted for pre-launch operations of the Soyuz and Progress spacecraft. Following a series of atmospheric test flights using the jet-powered OK-GLI prototype, the first operational spacecraft (Orbiter K1) flew one test mission on 15 November 1988 at 03:00:02 UTC. The spacecraft was launched unmanned from and landed at Baikonur Cosmodrome in the Kazakh S.S.R. and flew two orbits, travelling 83,707 kilometres (52,013 mi) in 3 hours and 25 minutes (0.14 flight days). Buran never flew again; the programme was cancelled shortly after the dissolution of the Soviet Union. In 2002, the collapse of the hangar in which it was stored destroyed the Buran orbiter. 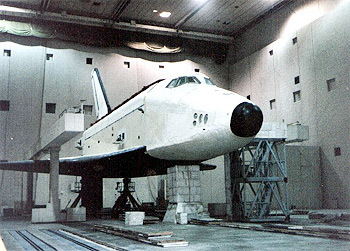 An aerodynamic testbed, OK-GLI, was constructed in 1984 to test the in-flight properties of the Buran design. Unlike the American prototype Space Shuttle Enterprise, OK-GLI had four AL-31 turbofan engines fitted, meaning it was able to fly under its own power. The only orbital launch of the Orbiter K1 Buran (also known as ""OK-1K1" or "Shuttle 1.01") was at 3:00 UTC on 15 November 1988 from pad 110/37 in Baikonur. The unmanned craft was lifted into orbit by the specially designed Energia booster rocket. The life support system was not installed and no software was installed on the CRT displays. The shuttle orbited the Earth twice in 206 minutes of flight. On its return, it performed an automated landing on the shuttle runway at Baikonur Cosmodrome. 1991 — Orbiter K2 Ptichka unmanned first flight, duration 1–2 days. 1992 — Orbiter K2 Ptichka unmanned second flight, duration 7–8 days. Orbital maneuvers and space station approach test. 1993 — Orbiter K1 Buran unmanned second flight, duration 15–20 days. 1994 — Orbiter K3 Baikal first manned space test flight, duration of 24 hours. Craft equipped with life-support system and with two ejection seats. Crew would consist of two cosmonauts with Igor Volk as commander, and Aleksandr Ivanchenko as flight engineer. Second manned space test flight, crew would consist of two cosmonauts. Third manned space test flight, crew would consist of two cosmonauts. Fourth manned space test flight, crew would consist of two cosmonauts. Amusement rides and Buran shuttle test vehicle OK-7M/OK-TVA at Gorky Park in Moscow. After the first flight of a Buran shuttle, the project was suspended due to lack of funds and the political situation in the Soviet Union. The two subsequent orbiters, which were due in 1990 (informally Ptichka) and 1992 (informally Baikal) were never completed. The project was officially terminated on 30 June 1993, by President Boris Yeltsin. 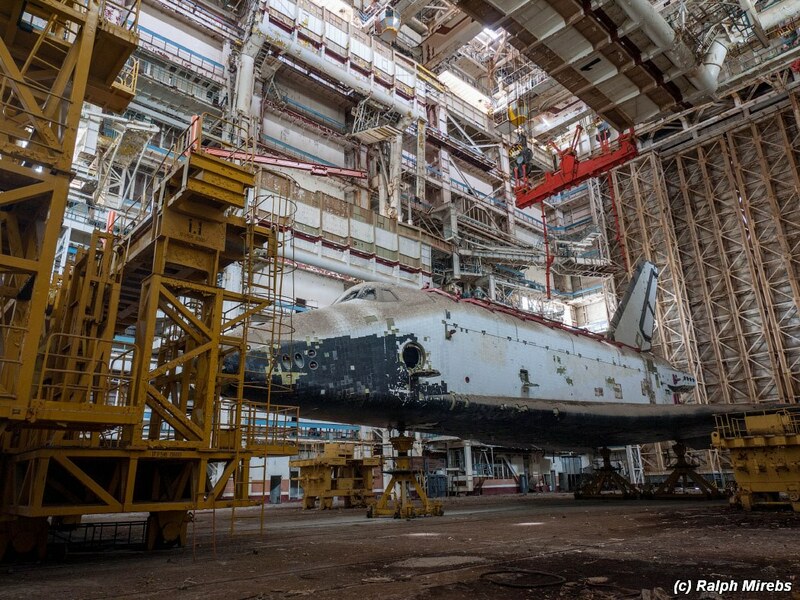 At the time of its cancellation, 20 billion rubles had been spent on the Buran programme. The programme was designed to boost national pride, carry out research, and meet technological objectives similar to those of the U.S. Space Shuttle programme, including resupply of the Mir space station, which was launched in 1986 and remained in service until 2001. When Mir was finally visited by a space shuttle, the visitor was a U.S. Shuttle, not Buran. The Buran SO, a docking module that was to be used for rendezvous with the Mir space station, was refitted for use with the U.S. Space Shuttles during the Shuttle–Mir missions. On 12 May 2002, a hangar roof at the Baikonur Cosmodrome in Kazakhstan collapsed because of a structural failure due to poor maintenance. The collapse killed 8 workers and destroyed one of the Buran craft (Orbiter K1), as well as a mock-up of an Energia booster rocket. It was not clear to outsiders at the time which Buran programme craft was destroyed, and the BBC reported that it was just "a model" of the orbiter. It occurred at the MIK RN/MIK 112 building at Site 112 of the Baikonur Cosmodrome, 14 years after the first and only Buran flight. Work on the roof had begun for a maintenance project, whose equipment is thought to have contributed to the collapse. Also, before the day of collapse, there had been several days of heavy rain. Most of the geo-location below show the shuttle bodies on the ground; in some cases Google Earth's History facility is required to see the shuttle within the dates specified. 1989 45°57′53″N 63°18′18″E﻿ / ﻿45.96486°N 63.30496°E﻿ / 45.96486; 63.30496 Spaceplane not visible; no available satellite photos. 15 November 1988 Built in 1986, only flightworthy orbiter. Launched on an unmanned, remote controlled flight; two orbits and landing (with heavy crosswinds and a self-initiated approach direction change) at Yubileiniy (Jubilee) Airport, Baikonur. MIK building, Baikonur Cosmodrome, Kazakhstan  2002 45°55′39″N 63°17′51″E﻿ / ﻿45.92750°N 63.29761°E﻿ / 45.92750; 63.29761 Spaceplane not visible; shadows. 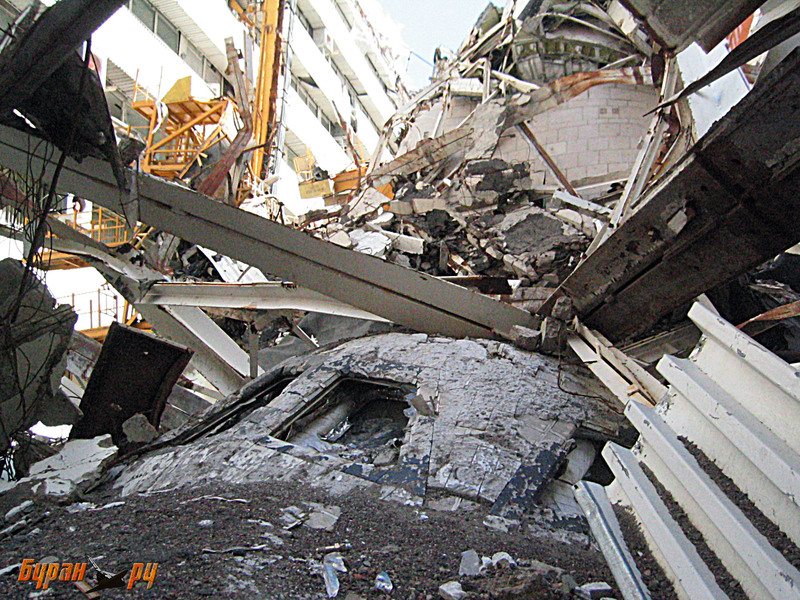 1988 to present Housed in MIK building in area 112, Baikonur with an Energia booster mockup and other Energia hardware, destroyed in a roof collapse on 12 May 2002, which killed eight workers. GRAU index 11F35 K2 Second flight article, first series, 95–97% complete MIK building, Baikonur Cosmodrome, Kazakhstan  45°55′42″N 63°17′53″E﻿ / ﻿45.92836°N 63.29809°E﻿ / 45.92836; 63.29809 Shuttle not visible, in building. 1988 to 2002 Built in 1988, housed adjacent to the Buran. 2015 45°56′26″N 63°19′06″E﻿ / ﻿45.94046°N 63.31841°E﻿ / 45.94046; 63.31841 Spaceplane not visible; in building. 2002 to present Moved to the MZK after the roof collapse in the MIK. GRAU index 11F35 K3 First flight article, second series, 30–50% complete Inside Tushino Plant, Moscow, Russia 1991 to 2006 Built 1991. Car park on Kimki Reservoir, near plant. 2007-2011 55°50′29″N 37°27′59″E﻿ / ﻿55.84136°N 37.46625°E﻿ / 55.84136; 37.46625 Need history. 2006 to 2011 Moved outdoors. on 11 September 2016 through 11 May 2018 55°34′17″N 38°08′35″E﻿ / ﻿55.57125°N 38.143°E﻿ / 55.57125; 38.143. GRAU index 11F35 K4 Second flight article, second series, 10–20% complete. Tushino plant, Moscow, Russia  1991–present Build started 1991, some pieces of 3K2, like heat tiles, have found their way onto eBay. GRAU index 11F35 K5 Third flight article, second series, very small amount assembled Scattered. 1988 to present All parts have been scattered and are unidentifiable. OK 0.01 Airframe and shake test bed article Outdoor pad, area 112, Baikonur Cosmodrome, Kazakhstan  45°55′11″N 63°18′36″E﻿ / ﻿45.91963°N 63.30996°E﻿ / 45.91963; 63.30996 Use history. 1988 to January 2007 Built in 1982, deteriorated considerably outdoors on pad. 2007 45°54′35″N 63°19′04″E﻿ / ﻿45.90963°N 63.31789°E﻿ / 45.90963; 63.31789 January 2007 to present Refurbished in 2007, now on outdoor display. OK 0.02 Atmospheric test article, two extra jet engines in rear to facilitate take-off. Ramenskoye Airport, Moscow 55°33′47″N 38°08′50″E﻿ / ﻿55.5631°N 38.14716°E﻿ / 55.5631; 38.14716 No history available this far back. 1999 Built in 1984, used in 25 test flights. On display at MAKS-1999, Russia's most prestigious airshow. 2002 33°51′50″S 151°11′48″E﻿ / ﻿33.86392°S 151.19662°E﻿ / -33.86392; 151.19662 Use history to see shelter; shuttle not visible. February 2000 to September 2000; afterwards stored on the site until about Oct 2002 Sold and sent in February 2000 to the Sydney, Australia 2000 Olympic Games. Displayed inside a light structure, stored outdoors there afterwards. Manama harbor, Bahrain 26°11′54″N 50°36′09″E﻿ / ﻿26.19826°N 50.60243°E﻿ / 26.19826; 50.60243 Use history. July 2004 to 2007 Stored outdoors in Bahrain while the ownership of the spaceplane was legally contended. 2008 49°18′43″N 8°26′47″E﻿ / ﻿49.31185°N 8.44628°E﻿ / 49.31185; 8.44628 Shuttle not visible; in building. 2008 to present Purchased from Roscosmos State Corporation when it won the legal battle, displayed indoors. OK 0.03 Electrical test article. Checkout and Test Building (KIS), RKK Energia Plant, Korolev, Russia  55°55′17″N 37°47′57″E﻿ / ﻿55.92132°N 37.79929°E﻿ / 55.92132; 37.79929 Not visible, in building. This location shows a half-scale memorial of Energia and the Buran, perhaps meant to be replaced. 2006 to 15 October 2012 Built in 1982. Stored inside. Grounds of the RKK Energia plant 55°55′01″N 37°47′58″E﻿ / ﻿55.91685°N 37.79937°E﻿ / 55.91685; 37.79937 15 October 2012 to June 2017 Stored outside by 15 October 2012, intended to be placed on permanent display. Sirius Science Center, Sochi, Krasnodar Krai, Russia 43°24′52″N 34°56′57″E﻿ / ﻿43.41441°N 34.94917°E﻿ / 43.41441; 34.94917 June 2017 to current On permanent outdoor display at the Sirius Science Center in Sochi, Russia. 2015 45°56′26″N 63°19′06″E﻿ / ﻿45.94046°N 63.31841°E﻿ / 45.94046; 63.31841 Spaceplane not visible; in building. 1988 to present Built in 1983. OK 0.05 Environmental test parts from forward fuselage Unknown 1988 to present Destroyed, parts used for OK-TVA. 2010 55°43′44″N 37°35′49″E﻿ / ﻿55.72876°N 37.59688°E﻿ / 55.72876; 37.59688 Use history. 1995 to July 2014 Served as a not-as-popular-as-expected attraction, a small restaurant, and bicycle storage. It did outlast the amusement park at that site, however, before it was next moved. 2014 55°49′56″N 37°37′22″E﻿ / ﻿55.83219°N 37.62291°E﻿ / 55.83219; 37.62291 Use history. July 2014 to present Moved to VDNKh on 5 July 2014, assembled by 21 July. The shuttle acquisition is part of VDNKh refurbishment. OK 0.08 Components used for static thermal and vacuum tests. Outdoor display at Clinical Hospital № 83 FMBA on Orekhovy Boulevard in Moscow. Unnamed Wooden wind tunnel model, 1/3 scale. Ramenskoye Airport, near Moscow, Russia, photographed in 2013. 2013 up to 2013 Has been destroyed in or after 2013. Photographed at Zhukovsky Airfield by Aleksander Makin. BOR-4 1982–1984 Sub-scale model of the Spiral space plane 1:2 scale model of Spiral space plane. 5 launches. NPO Molniya, Moscow. BOR-5 ("Kosmos") 1983–1988 Suborbital test of 1/8 scale model of Buran 5 launches, none were reflown but at least 4 were recovered. NPO Molniya, Moscow. Wind tunnel models Scales from 1:3 to 1:550 85 models built; see unnamed test article in table above. Over time, several scientists looked into trying to revive the Buran programme, especially after the Space Shuttle Columbia disaster. The 2003 grounding of the U.S. Space Shuttles caused many to wonder whether the Russian Energia launcher or Buran shuttle could be brought back into service. By then, however, all of the equipment for both (including the vehicles themselves) had fallen into disrepair or been repurposed after falling into disuse with the collapse of the Soviet Union. In 2010 the director of Moscow's Central Machine Building Institute said the Buran project would be reviewed in the hope of restarting a similar manned spacecraft design, with rocket test launches as soon as 2015. Russia also continues work on the PPTS but has abandoned the Kliper program, due to differences in vision with its European partners. Due to the 2011 retirement of the American Space Shuttle and the need for STS-type craft in the meantime to complete the International Space Station, some American and Russian scientists had been mulling over plans to possibly revive the already-existing Buran shuttles in the Buran programme rather than spend money on an entirely new craft and wait for it to be fully developed but the plans did not come to fruition. On the 25th anniversary of the Buran flight in November 2013, Oleg Ostapenko, the new head of Roscosmos, the Russian Federal Space Agency, proposed that a new heavy lift launch vehicle be built for the Russian space program. The rocket would be intended to place a payload of 100 tonnes (220,000 lb) in a baseline low Earth orbit and is projected to be based on the Angara launch vehicle technology. The Buran orbiter ranks among the world's first spaceplanes, with the North American X-15, the Space Shuttle, SpaceShipOne, and the Boeing X-37. Of these, only the Buran and X-37 spaceflights were unmanned. Unlike the US Space Shuttle, which was propelled by a combination of solid boosters and the shuttle orbiter's own liquid-fuel engines fueled from a large fuel tank, the Soviet/Russian shuttle system used thrust from the rocket's four RD-170 liquid oxygen/kerosene engines developed by Valentin Glushko and another four RD-0120 liquid oxygen/liquid hydrogen engines. Because Buran's debut followed that of Space Shuttle Columbia's, and because there were striking visual similarities between the two shuttle systems—a state of affairs which recalled the similarity between the Tupolev Tu-144 and Concorde supersonic airliners—many speculated that Cold War espionage played a role in the development of the Soviet shuttle. Despite remarkable external similarities, many key differences existed, which suggests that, had espionage been a factor in Buran's development, it would likely have been in the form of external photography or early airframe designs. One CIA commenter states that Buran was based on a rejected NASA design. See the § Programme development section above. Buran had no main engines; take off and ascent trajectory were accomplished with the Energia rocket whose four main engines were expendable. The three Space Shuttle main engines were part of the orbiter, and were reused for multiple flights. The core Energia rocket was equipped with its own guidance, navigation, and control system - unlike Space Shuttle whose entire control system was in the orbiter. Unlike Space Shuttle's boosters, each of Energia's four boosters had their own guidance, navigation, and control system, which allowed them to be used as launch vehicles on their own to deliver smaller payloads than those requiring the complete Energia-Buran system. Energia could be configured with four, two or no boosters for payloads other than Buran, and in full configuration was able to put up to 100 metric tons into orbit. The Space Shuttle orbiter was integral to its launch system and was the system's only payload. Energia's four boosters used liquid propellant (kerosene/oxygen). The Space Shuttle's two boosters used solid propellant. The liquid fueled booster rockets were not constructed in segments vulnerable to leakage through O-rings, which caused the destruction of Challenger. The Energia rocket was not covered in foam, the shedding of which from the large fuel tank led to the destruction of Columbia. Energia's four boosters were designed to be recovered after each flight, though they were not recovered during Energia's two operational flights. The Space Shuttle's boosters were recovered and reused. Buran's equivalent of the Space Shuttle Orbital Maneuvering System used GOX/LOX/Kerosene propellant, with lower toxicity and higher performance (a specific impulse of 362 seconds (3.55 km/s) using a turbopump system) than the Shuttle's pressure-fed monomethylhydrazine/dinitrogen tetroxide OMS engines. Buran was designed to be capable of both piloted and fully autonomous flight, including landing. The Space Shuttle was later retrofitted with automated landing capability, first flown 18 years after the Buran on STS-121, but the system was intended to be used only in contingencies. The nose landing gear was located much farther back on the fuselage rather than just under the mid-deck as with the NASA Space Shuttle. Buran included a drag chute, the Space Shuttle originally did not, but was later retrofitted to include one. 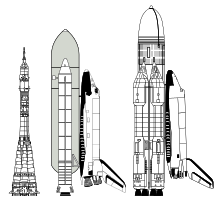 The lift-to-drag ratio of Buran is cited as 6.5, compared to a subsonic L/D of 4.5 for the Space Shuttle. Buran and Energia were moved to the launch pad horizontally on a rail transporter, and then erected and fueled at the launch site. The Space Shuttle was transported vertically on the crawler-transporter with loaded solid boosters. The Buran was intended to carry a crew of up to ten, the Shuttle carried up to eight in regular operation and would have carried more only in a contingency. ^ a b c Harvey, Brian (2007). The Rebirth of the Russian Space Program: 50 Years After Sputnik, New Frontiers. Springer. p. 8. ISBN 0387713565. ^ Russian shuttle dream dashed by Soviet crash. YouTube.com. Russia Today. 15 November 2007. Retrieved 16 July 2009. ^ Paul Marks (7 July 2011). "Cosmonaut: Soviet space shuttle was safer than NASA's". ^ "Antonov An-225 Mryia (Cossack)". The Aviation Zone. ^ a b c d e f g h Hendrickx & Vis 2007. ^ Zak, Anatoly (20 November 2008). "Buran – the Soviet 'space shuttle'". BBC News. Retrieved 7 December 2008. ^ Sparrow, Giles (2009). Spaceflight: The Complete Story From Sputnik to Shuttle—and Beyond. DK Publishers. p. 215. ISBN 9780756656416. ^ Windrem, Robert (4 November 1997). "How the Soviets stole a space shuttle". NBC News. ^ Fedotov, V. A. "BURAN Orbital Spaceship Airframe Creation". Buran-Energia.com. Retrieved 22 January 2013. ^ Petrovitch, Vassili. "VM-T Atlant: Description". Buran-Energia.com. Retrieved 22 January 2013. ^ Goebel, Greg. "The Antonov Giants: An-22, An-124, & An-225 – Antonov An-225 Mriya ("Cossack")". Airvectors.net. Retrieved 21 August 2012. ^ Goebel, Greg. "Postscript: The Other Shuttles – The Soviet Buran shuttle programme". Vectorsite.net. Retrieved 21 August 2012. ^ "Системное и прикладное программирование" [System and application programming]. 50th Anniversary of Institute for Applied Mathematics. Keldysh Institute of Applied Mathematics. 2004. Retrieved 24 March 2015. ^ "Отдел программных комплексов" [Department of software systems]. Keldysh Institute of Applied Mathematics. Retrieved 26 March 2015. ^ Kryukov, V.; Petrenko, A. (1996). Интегрированный подход к разработке крупных программных систем управления реального времени [An integrated approach to the development of large software systems, real-time control]. Индустрия программирования [Software industry]. Moscow. ^ "Soviet Software Productivity: Isolated Gains in an Uphill Battle" (PDF). Central Intelligence Agency. May 1990. p. 7. SW 90-10029X. Retrieved 9 July 2016. ^ Hendrickx, Bart; Bert Vis (4 October 2007). Energiya-Buran : The Soviet Space Shuttle. Praxis. p. 526. ISBN 0-387-69848-5. ^ Wade, Mark. "Mir LII-1". Encyclopedia Astronautica. Archived from the original on 30 November 2010. Retrieved 15 November 2010. ^ Hendrickx & Vis 2007, p. 349. ^ Hendrickx & Vis 2007, p. 356. ^ The New Book of Popular Science. 1. Scholastic. 2008. p. 257. ISBN 9780717212262. ^ Hendrickx & Vis 2007, p. 388. ^ a b Whitehouse, David (13 May 2002). "Russia's space dreams abandoned". BBC News. Retrieved 14 November 2007. ^ "Soviet shuttle". The Christian Science Monitor. 17 November 1988. p. 15. Retrieved 15 January 2013. ^ Barringer, Felicity (16 November 1988). "Soviet Space Shuttle Orbits and Returns In Unmanned Debut". The New York Times. Retrieved 15 January 2013. ^ "Shuttle Buran". NASA.gov. 12 November 1997. Archived from the original on 4 August 2006. ^ Chertok, Boris E. (2005). Siddiqi, Asif A. (ed.). Rockets and People (PDF). NASA History Series. 1. National Aeronautics and Space Administration. p. 179. SP-2005-4110. ^ Lukashevich, Vadim. Экипажи "Бурана": Несбывшиеся планы [The Crews of "Buran": Unfulfilled Plans]. Buran.ru (in Russian). Retrieved 5 August 2006. ^ Wade, Mark. "Yeltsin cancels Buran project". Encyclopedia Astronautica. Archived from the original on 30 June 2006. Retrieved 2 July 2006. ^ Wade, Mark. "Mir-Shuttle Docking Module". Encyclopedia Astronautica. Archived from the original on 8 January 2010. Retrieved 16 July 2009. ^ Petrovitch, Vasili. "Buran-Energia". Retrieved 20 February 2015. ^ Zak, Anatoliy. "Buran". Archived from the original on 15 February 2015. Retrieved 20 February 2015. ^ "Space shuttle Buran heat shield thermal black tile excellent condition". ^ Zak, Anatoly. "Buran reusable shuttle". Russian Space Web. Archived from the original on 15 February 2015. Retrieved 22 February 2015. See the last line of the cronology. ^ "Космический корабль "Буран" установят в детском центре в Сочи". TASS.ru (in Russian). 16 June 2017. Retrieved 21 June 2017. ^ "Mockup of the legendary Buran orbiter is being readied for shipment to Sirius educational center". Russian Aviation. 29 June 2017. 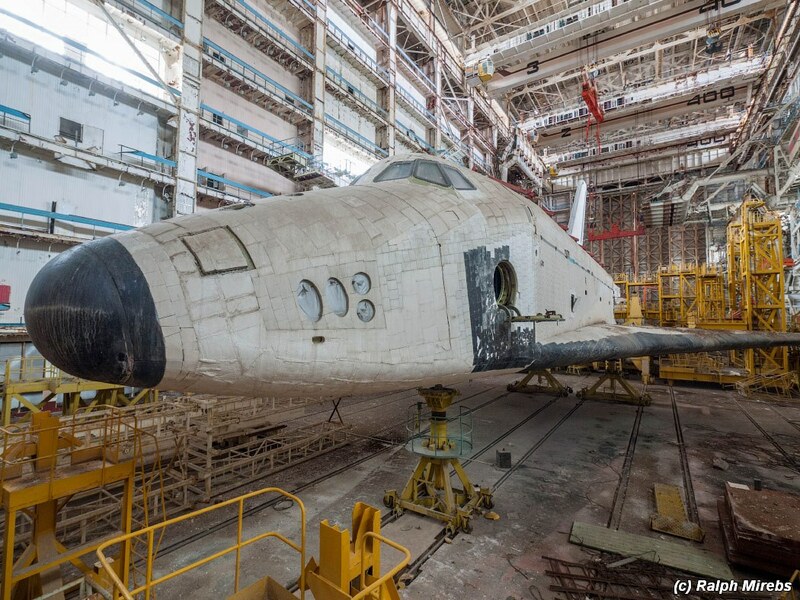 ^ "Buran: The Abandoned Russian Space Shuttle". Urban Ghost Media. 30 September 2010. Retrieved 21 August 2012. ^ "Transportation of the shuttle to the VDNKh park". Buran-Energia.com. Retrieved 21 June 2017. ^ Makin, Aleksander. "It no longer exists. 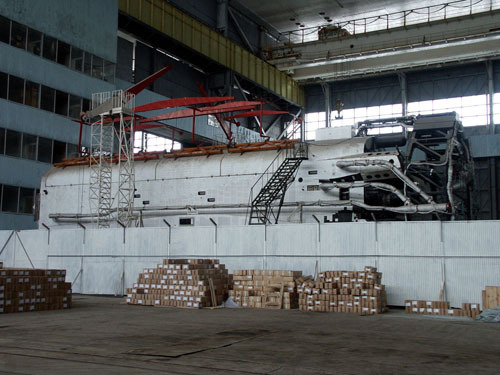 Wind tunnel wooden model 1:3 scale model of Buran is at the corner of Zhukovsky airfield". ^ "Energia-Buran: Where are they now". K26.com. Archived from the original on 19 May 2006. Retrieved 5 August 2006. ^ a b Birch, Douglas (5 February 2003). "Russian space program is handed new responsibility". The Baltimore Sun. Archived from the original on 3 December 2013. Retrieved 17 October 2008. ^ a b Oberg, James (10 June 2005). "Russia ready to take lead on space station". NBC News. Retrieved 16 July 2009. ^ "Russia To Review Its Space Shuttle Project". Space Daily. Xinhua. Retrieved 28 July 2010. ^ "Soviet space shuttle could bail out NASA". Current.com. 31 December 2008. Archived from the original on 8 July 2012. Retrieved 15 July 2009. ^ "Soviet space shuttle could bail out NASA". Russia Today. Archived from the original on 5 January 2013. Retrieved 15 July 2009. ^ "Russia, Europe abandon joint space project — Roscosmos". RIA Novosti. Retrieved 29 January 2009. ^ "Russia starts ambitious super-heavy space rocket project". Space Daily. 19 November 2013. Retrieved 13 December 2013. ^ Weiss, Gus W. (1996). "The Farewell Dossier: Duping the Soviets – A Deception Operation". Studies in Intelligence. Central Intelligence Agency. 39 (5). Retrieved 8 August 2012. ^ "Space Shuttle: Solid Rocket Boosters". NASA.gov. Retrieved 16 October 2010. ^ Lukashevich, Vadim. "Объединенная двигательная установка (ОДУ)" [Joint Propulsion System (JPS)]. Buran.ru. Retrieved 21 November 2013. ^ Malik, Tariq (29 June 2006). "Shuttle to Carry Tools for Repair and Remote-Control Landing". Space.com. ^ Wade, Mark. "Shuttle". Encyclopedia Astronautica. Retrieved 20 September 2010. ^ a b Scott, Jeff (5 February 2007). "Soviet Buran Space Shuttle". Aerospaceweb.org. ^ ""Molniya" Research & Industrial Corporation". Buran.ru. Retrieved 20 September 2010. ^ Chaffee, Norman, ed. (1985). Space Shuttle Technical Conference, Part 1. NASA. p. 258. N85-16889. ^ "Buran, the First Russian Shuttle". EnglishRussia.com. 14 September 2006. Retrieved 21 August 2012. ^ "Russian rockets". The Mars Society. Retrieved 21 August 2012. ^ "6 Abandoned Mega-Machines: Jumbo Jets, Space Shuttle Transporters & More". Urban Ghosts. 26 January 2011. Retrieved 21 August 2012. ^ Sands, Jason (May 2007). "NASA Diesel-Powered Shuttle Hauler – The Crawler". Diesel Power. ^ Ceccacci, Anthony J.; Dye, Paul F. (12 July 2005). "Contingency Shuttle Crew Support (CSCS)/Rescue Flight Resource Book" (PDF). NASA. Retrieved 9 September 2014. Hendrickx, Bart; Vis, Bert (2007). Energiya-Buran: The Soviet Space Shuttle. Springer-Praxis. doi:10.1007/978-0-387-73984-7. ISBN 0-387-69848-5.